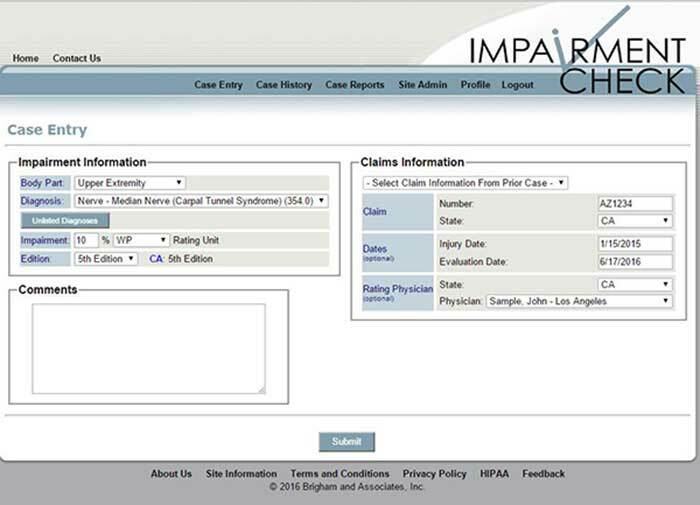 ImpairmentCheck® (www.impairmentcheck.com) assists claims professionals and attorneys in improving the accuracy of impairment ratings based on the AMA Guides to the Evaluation of Permanent Impairment. It is a screening and educational tool that provides guidance on probable impairment for most ratable injuries and collects data for continuous quality improvement. 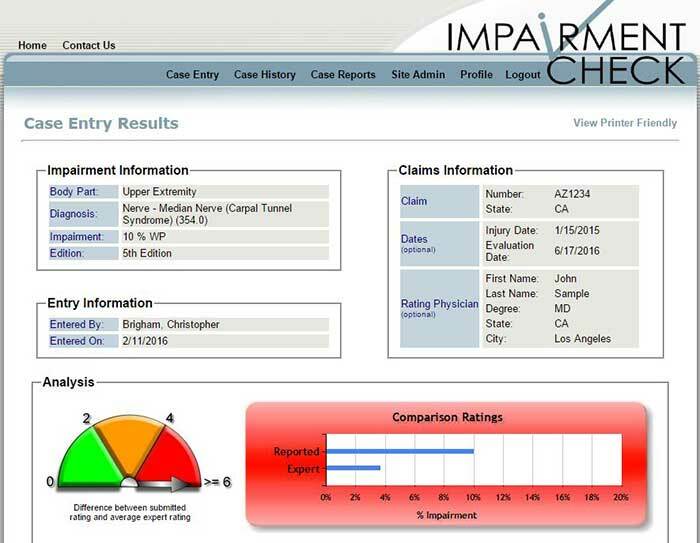 The system is based on unique web-based patented technologies (8,185,410; 8,615,411) ImpairmentCheck® may be integrated with other best practices processes to assure the most cost-effective management of impairment ratings, either post-rating or proactive rating management. Assists in assuring impairment ratings appropriately reflect the actual impairment associated with an injury. Easy to use, available 24/7 with immediate results. 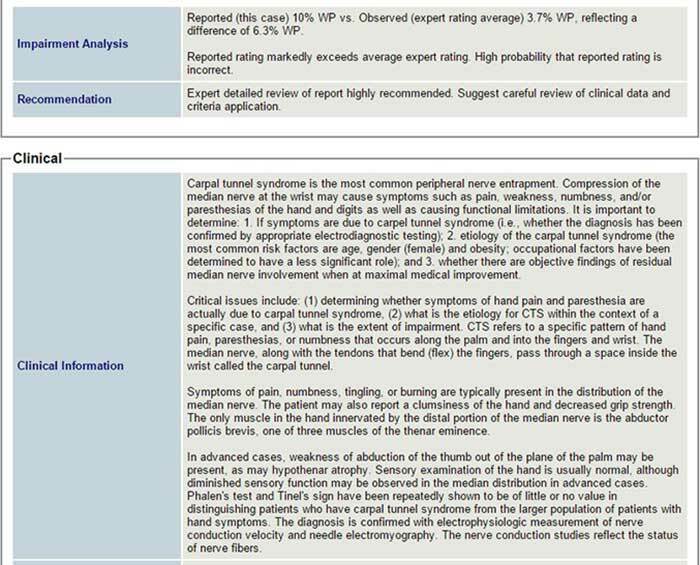 Compares your ratings with commonly observed values, and obtain guidance on management of the rating, clinical issues, maximum medical improvement (MMI), and the impairment assessment process. Therefore, you will make an informed decision on managing the rating. Includes over 2500 physicians in United States and Canada in its database; others may be added. Offers information for a specific injury on the probable impairment and date of MMI to proactively manage the case. Records data useful for claims management and continuous quality improvement; you may pool data among groups. Low cost annual subscription with no additional fee per evaluation. Ten day free trial. 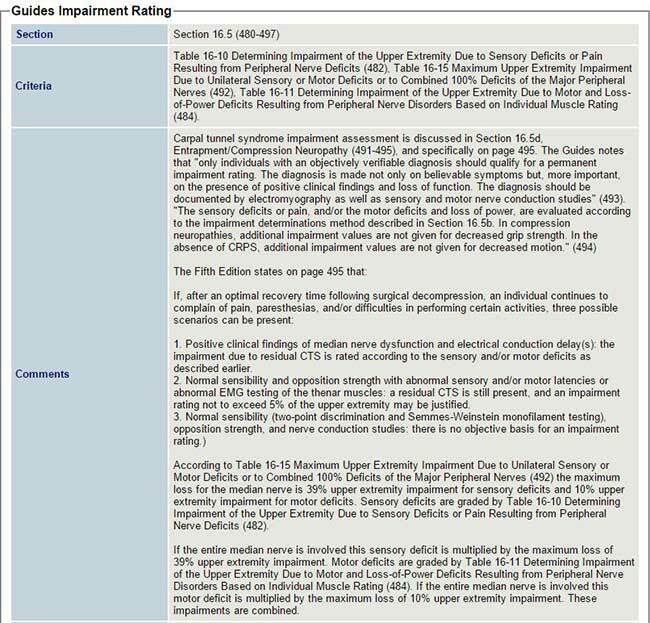 A study involving the analysis of more than 6,000 cases revealed a disagreement rate of 78% with expert rating values averaging 10% whole person permanent impairment less than the original rater. (Brigham CR, Uejo C, Dilbeck L, Uehlein WF. Impairment Ratings: Observations Based on Review of More Than 6,000 Cases. Guides Newsletter, March / April 2010). Depending on jurisdiction, this difference may reflect several thousands of dollars. The annual subscription fee is a small fraction of this amount. Therefore, correcting a single report is likely to result in a return on investment several fold – and the user has access for all cases 24/7 for a year. 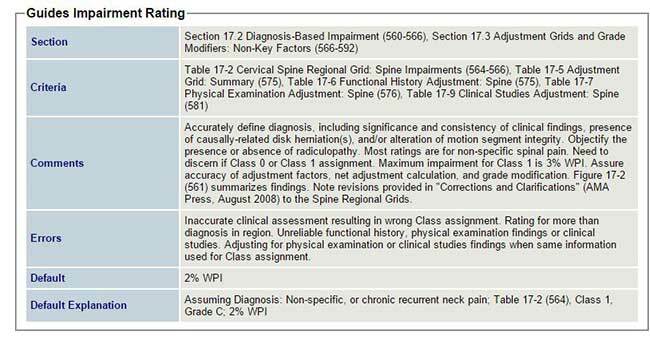 With ImpairmentCheck® the user specifies the body region, the diagnosis, the impairment value assigned by the rating physician, the Edition of the Guides that was used, and a case/file number. 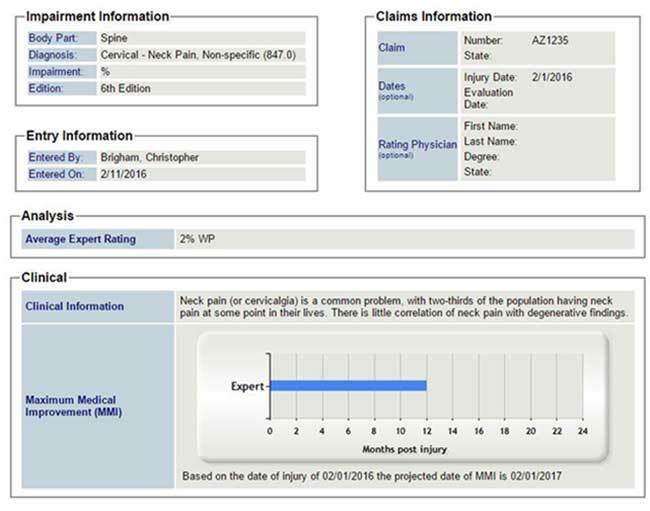 Optionally, the user may specify the injury date, evaluation date, and rating physician (selecting from a list of over 2500 physicians or adding a physician). If there is a significant difference the user will want to carefully review the rating and/or involve an expert (internal or external to the organization) to determine if the rating is supportable. You are provided with a discussion of the most common errors with reference to the Guides. Therefore, you can determine if these errors may have been made. This information may be provided to the rating physician in advance of the evaluation to assist in developing an accurate impairment rating. ImpairmentCheck® collects all the data submitted by the user and this data may be used for continuous quality improvement. Reports are provided for case entries, diagnoses and summary, and physician profiling. The reports are displayed on demand and may be exported as Excel (.xls) files. ImpairmentCheck® is available on a subscription basis or a per case basis with monthly batch billing. The annual subscription fee is a fraction of the value associated with one unit value in a rating– yet you have access for all of your cases for a full year. Consistent use of ImpairmentCheck® will increase the accuracy of ratings and provide value to your organization. Claims organizations may elect to pay on a per case basis with periodic batch billings (monthly or quarterly). Each claims professional (adjuster) and attorney will have their own individual account so they can manage their specific cases. Each client has a designated administrator and specific users. Each user can view their own cases and the administrator may view all of their cases. Clients may associate themselves as a group and pool non identifying data to profile large datasets providing more insight to physician performance and the impairment values associated with specific diagnoses. 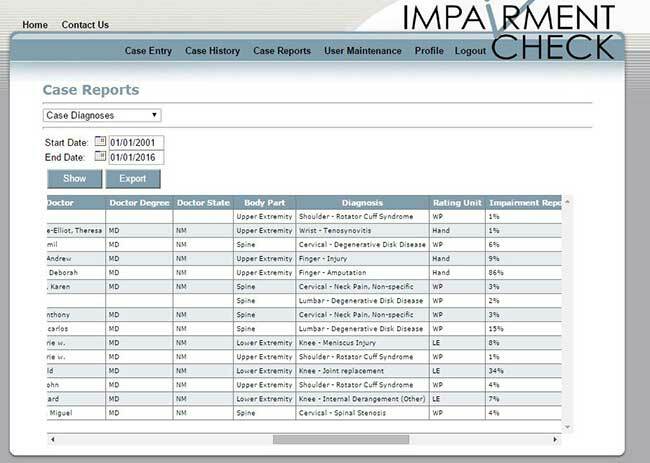 ImpairmentCheck® can be integrated into claims management software systems with an application program interface (API). ImpairmentCheck® is offered with a no-risk 10 day trial. Subscribe now and more effectively manage impairment ratings. If integrated into your claims management processes it is probable that this system will provide a high return on investment.